I have long been fascinated by the strong winds found in the Southern hemisphere such as the Roaring Forties, the Furious Fifties and the Screaming Sixties. A small bit of research reveals the often stated reason for these anomalously strong winds: the scarcity of landmasses . I wondered one day how true this statement really is so I set out to write some code to find out. My method is simple: obtain the coastlines as shapes; intersect a line of latitude with the coastline shapes; find the length along the line of latitude that falls over land; plot these lengths versus latitude to hopefully show the scarcity of landmasses between South America and Antartica. Please note: The below script takes a few minutes to run because it is using pyguymer.add_map_background(ax, resolution = "large4096px") and using the "10m" Natural Earth coastline dataset. If you would like to run it quickly for your own testing then remove the resolution keyword argument from pyguymer.add_map_background (on line 32) to just have it run at its default (low) resolution and replace all instances of resolution = "10m" with resolution = "110m" (on lines 33 and 37). It runs optipng during its execution. The script creates two output files: land_vs_latitude.png and land_vs_latitude.csv. 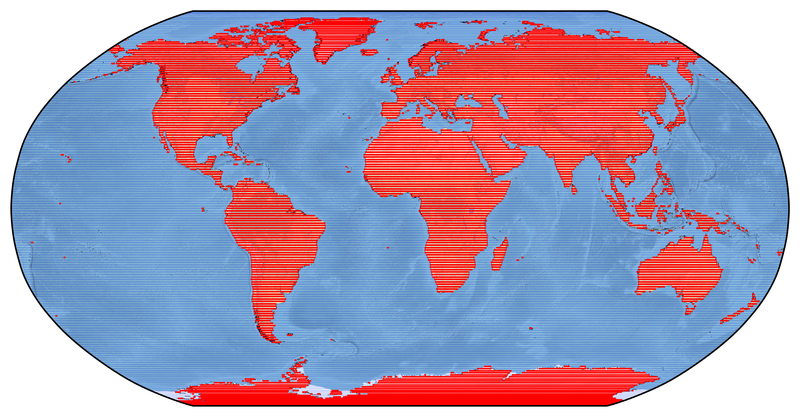 The PNG image is shown below and displays each line of latitude in red when it is over land and in blue when it is over water. The CSV file can be downloaded and it reports the length (in km) that each line of latitude exists over land for. I then wrote a simple gnuplot script to plot the CSV file with some labels (shown below). Below you will see the conclusion of this little project. There are only two regions in the world where there isn’t any land along lines of constant latitude: The North Pole and between South America and Antartica. What I find interesting about this is also how thin the southern extent of South America is - the land really trails off which allows the winds to pick up speed.